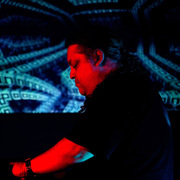 Ron Boots is among the most engaging Electronic Musicians to ever export music from The Netherlands. Since the late 1980s, his work has been rooted in the Berlin School, yet reaches far beyond the basic fundamentals of the genre. Combining elements of Contemporary Instrumental, film soundtracks and Spacemusic, Boots' music moves easily between the mainstream and the cosmic. Along with many noted albums, concerts and collaborations, Ron Boots has also been an encouraging force to a myriad of emerging artists. His record label, Groove Unlimited, and music festivals, E-Live and E-Day, have overseen the production of numerous significant releases and concert events. An avid concert performer, Ron Boots at last made his solo Stateside debut - in Philadelphia at The Gatherings Concert Series on Saturday 18 March 2017. Many Thanks to Everyone Who Attended! 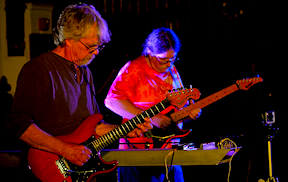 Guitar Pilots is the new spacemusic duo featuring guitarists Art Cohen and Scott Watkins. Their music features lengthy structured improvisational pieces which transport the listener to the depths of space, all the while focusing on each precious unfolding moment. Cohen's sequencer-like echoing guitar figures provide rhythmic propulsion, while Watkins' breathing chords and sub-octave rumblings build a foundation for both musicians to rise in melodic flights. Singing glissando blends seamlessly with plucks, twangs and blasts of an interstellar beam. Following the trail blazed by Pink Floyd, The Grateful Dead, and the Berlin School, Guitar Pilots carve out their own unique sonic territory that is both organic as the ground underneath and as far-reaching as a distant pulsar. Guitar Pilots, plus noted soundscape guitarist Andrew Chalfen, performed at The Gatherings Concert Series on 22 April 2017. This show offered no admission charge. Thanks to everyone who attended and made a donation! Music with Space radio show host and multi-instrumentalist Mike Hunter uses the name Ombient to make live music befitting of any situation. During his many concert outings he has realized a range of performances - from those of great portent down to the more ethereal and diffuse. Possessed by a unique atmospheric sensitivity he is currently exploring the sonic territory of Spacemusic's 1970s Berlin-School - utilizing a number of classic electronic instruments, among them a substantial four cabinet "Synthesizers Dot Com" modular system. Ombient will be joined on-stage at The Gatherings Concert Series by fellow Electronic Musician Chuck van Zyl. Ombient, plus noted Electronic Musician Geoffrey Waterman, perform at The Gatherings Concert Series on 20 May 2017. This show offers no admission charge, donations gratefully accepted! Robert Rich finds expression in his works by fusing nature, technology, art and craft into a sonic replica of our earthly macrocosm. His music is concise, exhilarating and charged by a keen sense of drama. Moving through his many albums we find multi-layered realizations enlivened by misty flute solos, floating glissando guitar, and ethereal synth pads. Less active areas within the meshes of musical fabric are like an oasis nestled inside his ambitious design. Conjuring soundscapes derived from the darkest regions of the earth, to the brightest grain of stardust, Rich's performances evoke the enigmatic nature of the universe while emphasizing its harmony with the human spirit. With his steel guitar, flutes, field recordings, synthesizers and samplers Robert Rich delves into the mysteries of the cosmos, and our place in it. 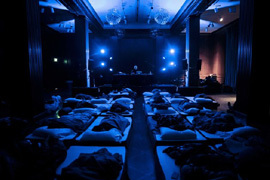 Robert Rich returned to Philadelphia and The Gatherings Concert Series for an eight hour sleep concert performance, from Midnight to 8AM, on Sunday 4 June 2016, within The Rotunda Sanctuary, 4014 Walnut Street in Philadelphia. Thanks to everyone who attended! This concert was broadcast live on WXPN/STAR'S END Ambient Radio, in commemoration of 40 years of broadcast. Sincere Thanks to IsoTank, Projekt Records, Robert Rich, WXPN, The Rotunda and to all of our supporters. Hotel Neon is a Philadelphia based ambient drone-guitar/synth trio. Consisting of Michael Tasselmyer, Andrew Tasselmyer and Steven Kemner, the music of Hotel Neon is characterized by blissed-out, gently moving forms and slowly evolving atmospheres. Their understated works for processed electric guitars entice the audience into a dreamy, wordless state. Emphasizing texture and mood, Hotel Neon provides an open-ended sonic environment meant for optimal being. As textural contrasts in sound reach the mind's eye through the body's ears, the movement of mood from dark to light stirs the listener's soul. Hotel Neon, plus electronic artist Datadrift performed at The Gatherings Concert Series on 16 September 2017. This show offered no admission charge. Thanks to everyone who attended! Jeff Pearce is well known to the Spacemusic community for his unique approach to the electric guitar. Pearce produces tones that rarely betray their origin as they are processed, delayed, distorted and looped to create complex harmonies and timbres. His music is compelling and moody, traversing the Space, Ambient, Experimental and New Age genres, and ranges from deep, dark soundworlds to bright, elegant, melodic compositions. Jeff Pearce, plus Eyes Cast Down, performed at The Gatherings Concert Series on 7 October 2017. This show offers no admission charge. Thanks to everyone who attended! 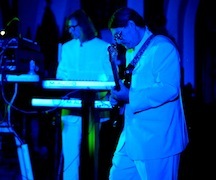 Consisting of electronic musician Chuck van Zyl and electric guitarist Art Cohen, The Ministry of Inside Things are considered among the most innovative of US spacemusicians today. 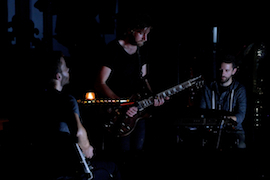 While their music touches on many of the hallmarks of Berlin-School Spacemusic, MoIT bring their own influences and innovation to the process. The result is a sound that is uniquely individual. 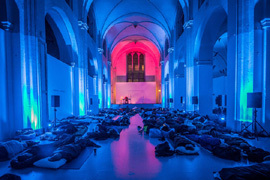 The Ministry of Inside Things, plus Hallowed Bells performed at The Gatherings Concert Series on 18 November 2017. This show offered no admission charge. Thanks for making a donation! 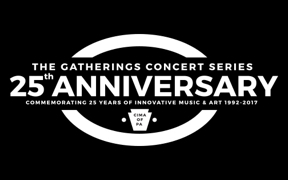 In 2017 The Gatherings Conert Series marks the 25th anniversay of its first event with seven special concerts. Please take note that the Ron Boots concert on 18 March 2017, and the Robert Rich Sleep Concert of 3/4 June 2017 are ticketed events with an admission fee. Additional details are forthcoming. Please check back for news and updates on our silver season! Thanks for all your support!